I sit here and look at my computer screen and scroll through the enormous amount of offerings for magnifying mirrors, wall mount mirrors or makeup mirrors. I see the deceptive tricks used by sellers and I wonder how it is you the customer can get the upper hand in the sale. I mean by upper hand knowing what you're getting, have recourse if you have issues, choose the right mirror if it's an electric model or are you able to call someone and ask a question. Looking through the sites online there is a plethora of American sites and even American sites that masquerade as Australian. These guys are the worst of the worse as they pretend to be from Australia yet their goods are drop shipped from the US with no regard for local laws. You also see many of our big retailers advertising for your dollar also. Apart from overpricing have you ever tried to contact one of these retailers on the phone? If you do happen to have someone pick up the phone then you will likely get a shop assistant? You will know they have far too many other things to worry about than to give you the information you seek. Many of those sites advertise without adding freight and handling fees and there is a distinct lack of haste. eBay items look attractive until you follow through and see that the recommended mirrors come from overseas or are no names with no warranty and no returns, or not contactable. Great prices we do admit if you are ok with waiting weeks for your delivery. Disappointing when your new LED lighted mirror fails within weeks of using it. Remember the weak point in LED lighted mirrors particularly from China is the electronics that fail not so much the globes. The sting in the tail is you cannot get anything done if there is an issue or it arrives broken or if you want to return it, from experience it sometimes does not arrive at all let alone the disappointing quality. Here at MHB we average more than a 100 calls a year from somebody who thought they were doing the right thing by buying from those big US sites and not know that they will only work in America as they use only half the power voltage we do here in Australia. America uses 110 volt Australia 240 volts. Thinking that a travel adaptor so you can plug it in will solve your problem is a huge mistake. If you are buying online from a supplier the first basic step is you must be able to find a phone number on their site to call them if you want to just check them out, need information or you need an issue resolved. Some of the US sites do have a number to call if you are happy to ring international. There are many online stores here in Australia including those eBay sellers you just cannot contact. Email is one option, however, these go mostly to the backburner after all the sale has been made. A virtual messenger on some sites is a horrible time wasting experience as many people do not realize they are corresponding with a computer despite the fact there appears to be a nice helpful face who asks how they can help. It's like a Russian style negotiation as they always defer to a higher authority meaning you get no joy there. Here at MHB you will not have any of those issues. We have our phone number listed in the top right-hand corner of every page. Freight is not an extra on our site the price you see is the mirror, GST, and freight all inclusive, no nasty extra surprises. If we have run out stock it's removed from the store unless we have a set date for when the container arrives. 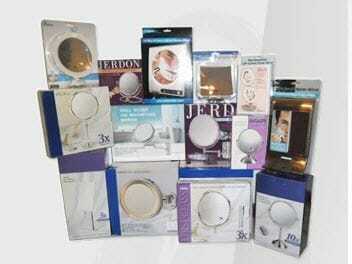 Our brands are Jerdon and Zadro mirrors so we don't get the faults that happen with the cheapies. If you are looking for guidance on what best to buy or just checking up when you can expect your purchase to arrive then, by all means, gives us a call. We always go the extra mile to ensure satisfaction. We have our own warehouse in Melbourne which means we can get goods out as fast as possible. We know from experience that getting your item to you fast means a lot. We process same day from the sale to freighting provided we meet the 2 o'clock cut off. Our team works hard to maintain that standard. Hopefully, this information will make your online buying experience a little easier. Our magnifying mirrors be they the travel type, wall mounted, LED lighted or even the 15x spot mirror make great gifts for Christmas so keep us in mind.